Lots of people drawing this week. While I don't really like drawing people because I find it difficult, I've either improved a bit or I've relaxed about the end result. I think it helps that I've begun experiencing different styles of drawing rather than trying to draw perfect detail. Some have just been an interesting experience--like drawing people in motion. 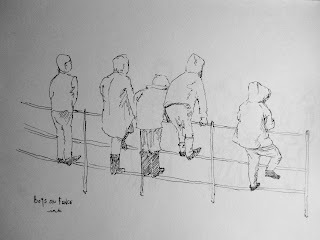 This drawing is my choice of the week: Boys on fence in ink. 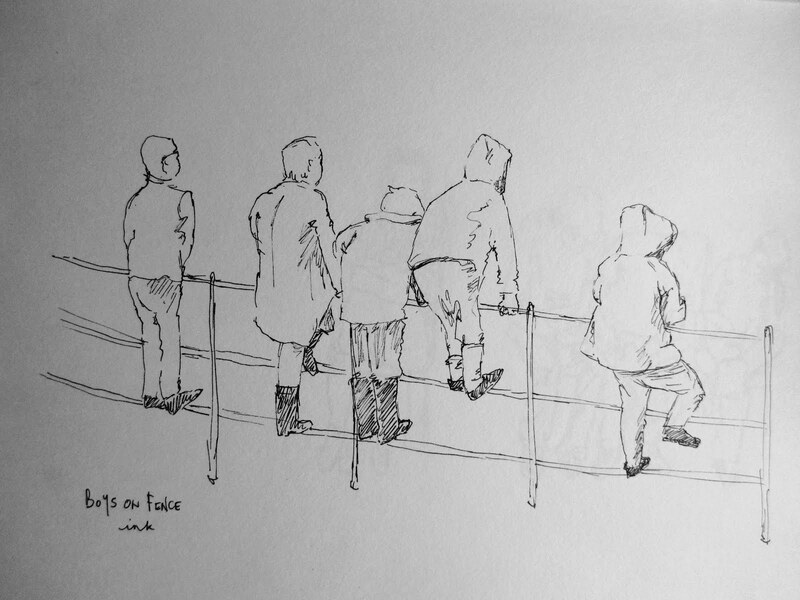 This task was to draw a group of spectators. I drew this early in the week on a day I knew I was to work a full day. I rose early so I could get my drawing done. I was very pleased with how it turned out. Taking care to match the size and preportions. Usually I don't particularly like drawing in ink either. It's so final and so fine but I must be getting the hang of it a bit. I tried not to worry about too much detail. In particular the colour of clothing. I like that I scribbled in their shoes/boots though. Adds a nice touch. Other than that it's just a tad of shading and enough detail to explain the shapes. I'm also pleased that I got through another week (with the boy I care for being sick and grumpy meaning some longer days for me) and managed again to draw every day. Woohoo. That being said, I'm taking a week off. I'm spending the last half of this week on a holiday in Iceland--if London's snow doesn't distrupt my flight.